Book piece in an edition of 1000 copies. Kajsa Dahlberg 2006. 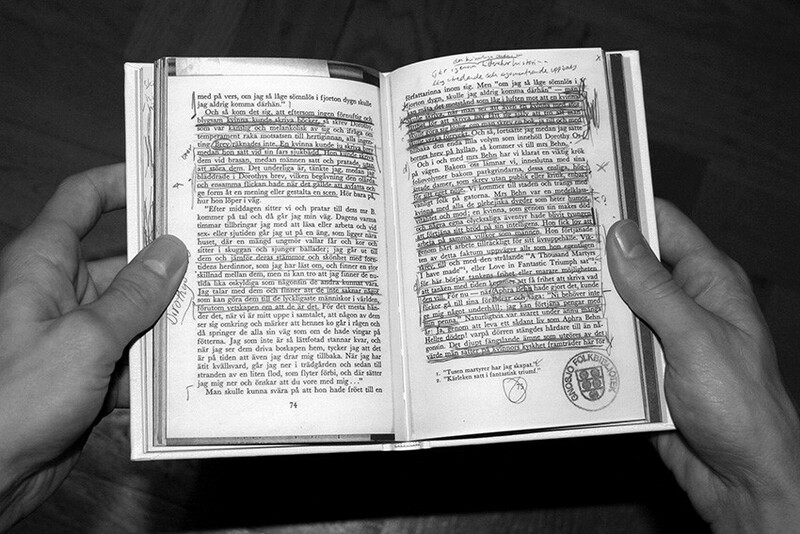 A Room of One’s Own / A Thousand Libraries is a compilation of all the marginal notes made by readers in the Swedish library copies of Virginia Woolf ’s 1929 essay A Room of One’s Own. The piece is an analogy to the content of the essay were Woolf, using Mary Beton as her alter ego, is searching for the representation of women throughout the history of literature. Throughout the book she is describing, not only the search for literature written by women, but the conditions under which it was written. In A Room of One’s Own / A Thousand Libraries Woolf ’s words are reframed within a collective script of responses, tied together across a period of nearly half a century (Woolf’s book first appeared in Swedish in 1958). One of the most underlined sentences is: For masterpieces are not single and solitary births; they are the outcome of many years of thinking in common, of thinking by the body of the people, so that the experience of the mass is behind the single voice. The essay “A room of One’s Own” was originally printed in October 1929 by Hogarth Press, England. Woolf's essay was translated to Swedish by Jane Lundblad.